There are many uses for essential oils. Keep a kit of basic oils around the house. Below are several ideas for using essential oils with aromatherapy and other body and mind benefits. There are a variety of diffusers available that effectively vaporize and disperse essential oils directly into the air. These devices are an excellent way to refresh the air, kill airborne bacteria, promote and enhance emotional health, and create various moods within your home and office environment. Bathing with essential oil is a delightful experience for the body, mind, and soul; and one of the most effective ways to benefit from an Aromatherapy treatment. 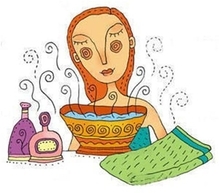 In hot water essential oils are readily absorbed into the body tissues and the aromatic vapors are inhaled. This benefits the entire body mind system. After the tub is filled, mix 3-8 drops of the chosen essential oil(s) into the water. For dry or sensitive skin, dilute essential oil(s) into one tablespoon of vegetable oil before adding to bath. When bathing young children or using essential oils that can irritate the skin, use less essential oil (2-3 drops) and always dilute in vegetable oil. Try Drops® Bath Tea Bags for a wonderful bathing experience! These bath tea bags are pre-made easy to use; they are made with an assortment of herbs mixed with a special blend of therapeutic grade essential oils. Breathe deeply, relax and forget your cares! Essential oils improve the health of the scalp, regulate oil secretion, and strengthen and stimulate the roots of the hair. Geranium, Sandalwood, and Ylang Ylang are suited for dry or damaged hair. Use diluted in vegetable oil, massage into scalp and hair leave in or apply heat for thirty minutes and shampoo. Rosemary, Cedarwood, Lavender, and Clary Sage are suited for oily hair; mix 5-10 drops total into 16 oz warm water, use as final rinse after shampooing. Cedarwood, Clary Sage, Rosemary, and Ylang Ylang stimulate hair growth. Cedarwood, Patchouli, Rosemary, and Tea Tree help eliminate dandruff. The easiest way to obtain and enjoy the benefits of essential oil is to simply inhale the aromatic fragrance directly from the bottle. Drops® Lavender Oil is wonderful for reducing stress. Try a few drops on a tissue or handkerchief to carry with you to inhale throughout the day when you are sick or put a few drops of lavender oil on your pillow at night or on a heated Neck Pillow as you relax. Essential oils can produce remarkable therapeutic results when used with massage. They have the ability to penetrate deeply into skin tissues and are then circulated throughout the entire body mind system; and inhaling the aromatic vapor also has an immediate and beneficial effect on the mind and emotions. Massage Oil mixtures are great as chest rubs, foot rubs, sports injuries if they contain the right essential oil blend. Drops® Arthritis Oils helps relieve the pain and swelling of sore and tired joints, use arthritis oil with self massage daily. For internal problems, massage the appropriate diluted oil(s) over the affected area. Use essential oil(s) as a pure and simple alternative to synthetic commercial perfumes that may contain harsh chemicals, animal products and many are tested on animals. Rub a drop of your favorite skin safe essential oil(s) onto your skin and enjoy the mood-enhancing, aromatic qualities. Use spray mists to purify and refresh your home, office, and your aura energy field. Lavender, Pine, and all of the citrus oils are particularly uplifting and refreshing. Eucalyptus, Lavender, Rosemary, and Tea Tree are powerful antiseptic oils for eliminating airborne bacteria during illness or any time. Juniper, Lavender, Peppermint, and Rosemary are excellent for clearing negative energies. Mix 10-20 drops of your favorite essential oil(s) into a spray bottle with purified water (shake well before each use). Drops® Derma Vera is a spray for the skin containing a blend of essential oils in a base of aloe vera, use derma vera spray for a refresher thoughout the day it is great for hair and skin of all types. Steam vapor inhalation is beneficial for respiratory conditions such as asthma, bronchitis, and coughs, as well as congestion, colds, flu, and sore throats. Use 5-12 drops total of essential oil(s) in 2 to 4 cups of water. Boil water and let cool for 1 minute then add the specific essential oil(s). Cover your head and the sides of the pan with a towel, close your eyes and inhale the steam vapor deeply for a few minutes. Essential oils easily penetrate into the underlying layers of the skin promoting regeneration and rejuvenation of skin cells. They can be added to your facial cleansers, toners, oils and lotions. You can also add essential oil(s) to facial steams and saunas. Always make sure your source for oils is a reputable one. Use Only pure therapeutic grade and/or NF essential oils. NORMAL: Geranium, Lavender, Neroli, Rose and Rosewood. DRY: Carrot Seed, Chamomile, Neroli, Palmarosa, Rose, Rosewood and Sandalwood. OILY: Bergamot, Cedarwood, Cypress, Geranium, Lavender, and Lemon. SENSITIVE: Chamomile, Jasmine, Neroli, and Rose. Palmarosa, Patchouli, Rose and Rosewood. CHAPPED: Benzion, Chamomile, Geranium, Rose, and Sandalwood.